In obedience to II Peter 1:13, I’m seeking to stir up the body of Christ by bringing the potter’s house to them and visually explaining the 8 stage process of forming clay. This parallels the 8 stage sanctification process of the believer found in II Peter 1:5-7. Understanding this process will encourage Christians to yield, surrender and serve. 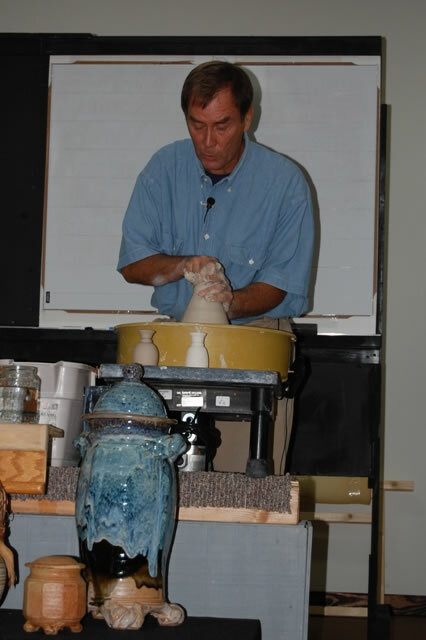 During my presentation I form clay vessels on a potters wheel while preaching the important aspects of the judgment seat of Christ. I will cover what it is, when it is, why we should prepare for it, and how to best prepare. This understanding will strengthen a believer to grow from simple salvation to being throughly prepared unto every good work. Thank you for considering me for a meeting at your church. My ministry is flexible to accommodate the needs of your congregation. My main message requires at least 2 sessions. Some churches have opted to have the 2 sessions with a meal in between them. I also have other 30 to 45 minutes messages that specifically support my main message, also involving the visual making of pottery on a wheel. The ideal scenario for me is to have 5 sessions usually spread over a 3 day period (for example, Friday night, Saturday night and 3 sessions on Sunday). Again, I am very flexible and will be willing to work with your schedule, whether it is a 1 day meeting or otherwise. Please prayerfully consider my ministry, David Engesath.